As someone who takes reviewing beers seriously I always worry about the various biases that slip into my reviews. If I’m unimpressed with a beer that is rated highly on BeerAdvocate, does that mean my tastes are not sufficiently refined, or is it a case of the emperor’s new clothes? If I’m drinking a beer that won a medal at the Great American Beer Festival, it’s hard not to be predisposed to give it a good review. The list of biases doesn’t stop there, but I’m sure you get the idea. Ryan Langrill at BeerGraphs has written a very good article on the biases that are most prevalent in beer ratings. If you are interested in that kind of thing I encourage you check out his article. Although not completely foolproof, the best way to avoid biases is to do blind taste tests. Therefore, I periodically organize blind taste tests to sample a variety of beers in a given style category. Styles that have been subjected to a Pat’s Pints blind taste test in the past include Belgian Quads, American Porters, Imperial IPAs, and Black IPAs. 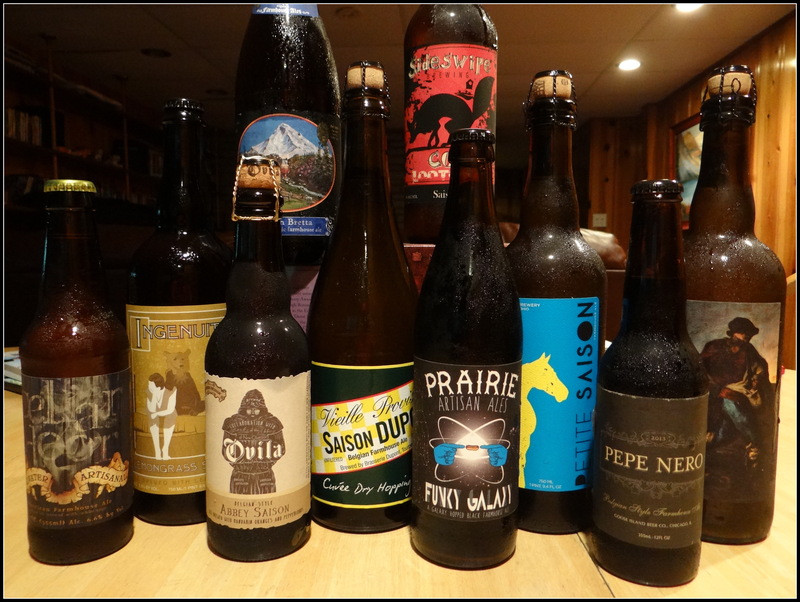 In this round of blind taste testing we focus on one of my favorite styles, Saisons. Before launching into the results of the taste test we’ll take a short detour to learn a little more about this Belgian style that was at one time almost extinct, but is now hipper than skinny jeans and a pair of Chuck Taylors. If you are already a Saison expert you can skip over those sections and get right to the results. The saison style originated in Wallonia, the French-speaking part of Belgium. Saisons were historically brewed through the cooler winter and spring months for consumption during the summer. They are often called farmhouse ales because they were brewed principally at farmhouse breweries for consumption by the farm hands. Just about every description of saisons that I’ve read mentions two pieces of information that seem slightly contradictory. They need to be strong enough to last through the summer without spoiling, but with a low enough abv that they could be served to farmworkers during the workday without inebriating them. At one point the saison style looked as though it might die out, but it has enjoyed a remarkable renaissance, especially among US craft brewers. At the 2013 Great American Beer Festival there were 119 entrants in the Saison category, sixth most among the 84 style categories. 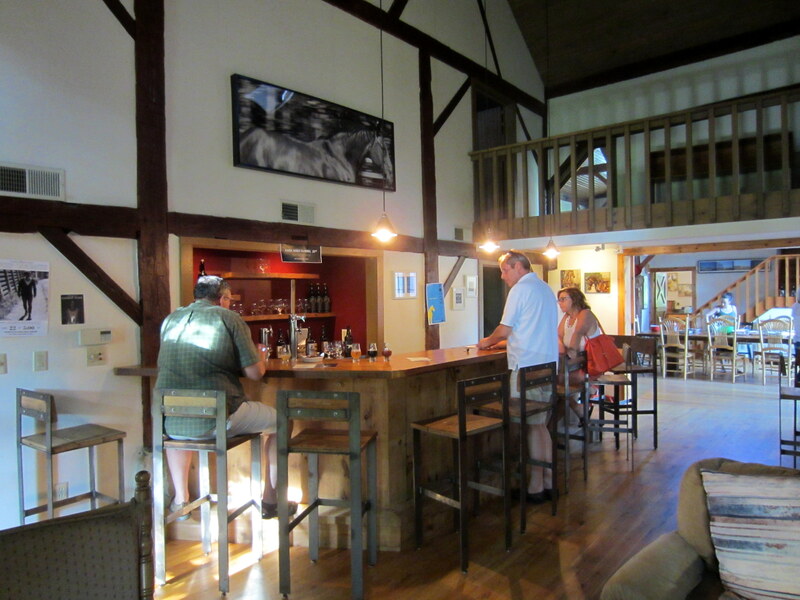 The tap room at Rockmill, a true farmhouse brewery. As with many Belgian styles a brewer can exercise considerable creativity and still fall under the big tent that is the saison family. The color can range from straw yellow to amber, and in recent times some breweries have even started brewing black saisons. Adjuct grains like wheat and spelt are sometimes used, but not required. A variety of herbs and spices can be found in saisons, but not all saisons contain them. The hop flavor and bitterness can range from low to moderate, but when the hops are noticeable they should be spicy or earthy in character. 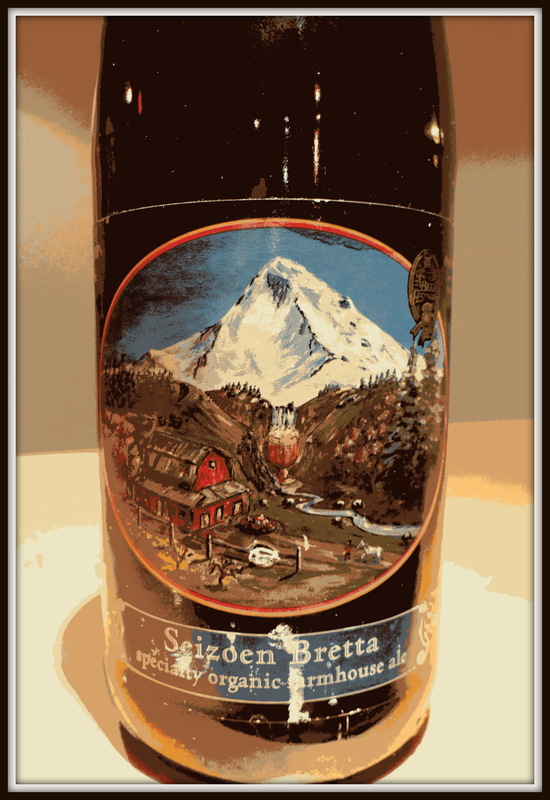 Some saisons are tart and mildly sour (like Sophie), while some make use of Brettanomyces yeast, aka Brett, to get those funky aromas and flavors beer reviewers call barnyard (like Seizoen Bretta). Because saisons are one of my favorite styles it was difficult to narrow down the field to a manageable number of beers. I wanted to include several local beers to see how they stacked up against highly regarded beers from elsewhere in the world, so four of the twelve beers I chose are from Central Ohio. Two beers, Saison Supér and Petit Saison, are from Rockmill Brewery. Rockmill specializes in Belgian-style beers and their brewery southeast of Columbus is actually located a farm. So it’s fitting they make farmhouse ales. 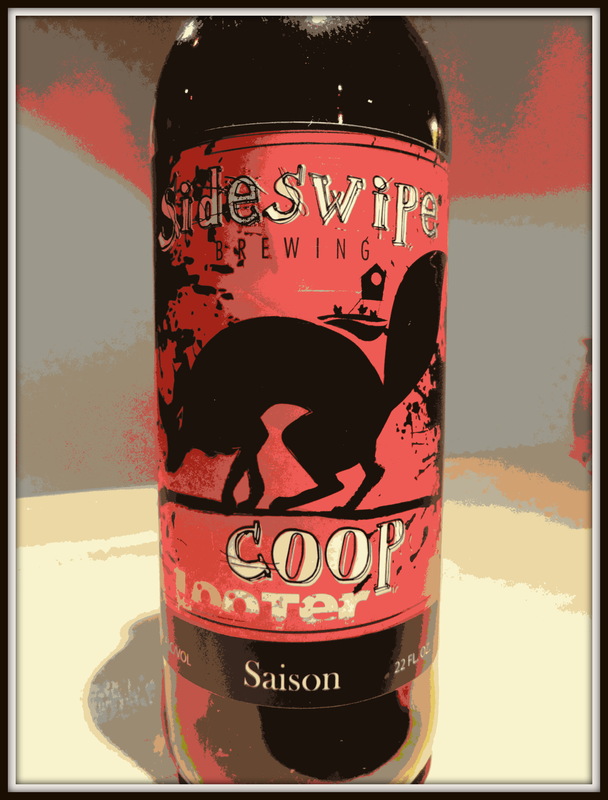 I’ve also included Coop Looter Saison from Sideswipe Brewing and Ingenuity Lemongrass Saison from Actual Brewing, both located in Columbus. I included one Belgian brewed saison that had been sitting in my beer refrigerator since last fall, Saison Hiver from Brasserie Fantôme. I rounded out the field with saisons from US craft breweries that are (for the most part) known to be adept at making Belgian-style beers: Hennepin from Brewery Ommegang (New York), Saison Rue from The Bruery (California), Pepe Nero from Goose Island (Illinois), Ovila Saison from Sierra Nevada (California), Seizoen Bretta from Logsdon Farmhouse Ales (Oregon), Funky Galaxy from Prairie Artesian Ales (Oklahoma), and Cellar Door from Stillwater (Gypsy/Contract brewer). To calibrate everyone’s tastes to what a saison is supposed to be we started with a bottle of the quintessential saison, Saison Dupont Vielle Provision. I won’t go into the details of that beer, suffice to say it is the classic against which other saisons are judged. If interested you can read my review of that beer. Just like previous blind tastings the judges were blind to the identities of the beers and we were using the BJCP scoring system (50 points in total—12 points for aroma, 3 points for appearance, 20 points for flavor, 5 points for mouthfeel, and 10 points for overall impression). My wife Laurinda graciously agreed to serve everyone so that I could participate in the tasting. 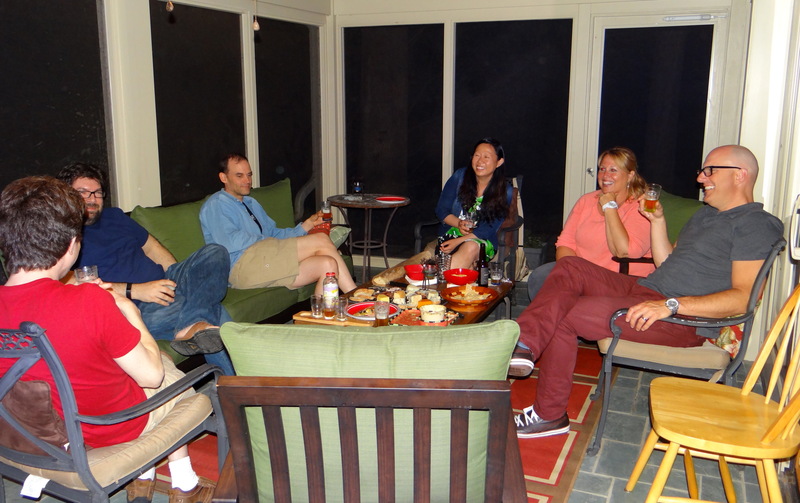 I was joined in the tasting by several of my beer loving friends: Mark and his wife Joan, Ted, Josh, Tom, and Anne. With the exception of Joan and Anne everyone else is a veteran of one or more Pat’s Pints taste test. Our distinguished panel of judges. Here are the results counting down from our lowest rated beer to the highest. The ratings represent the collective opinion of the tasting group. I have to say at the outset that nearly all of the beers were quite good. I would gladly buy and drink at least 11 of the 12 entrants. I’ve written reviews of several of the beers that finished in the middle of the pack and they have all received overall ratings of 8 or higher (on my 1-10 scale). So don’t be too upset if your favorite beer didn’t finish in one of the top couple of places. 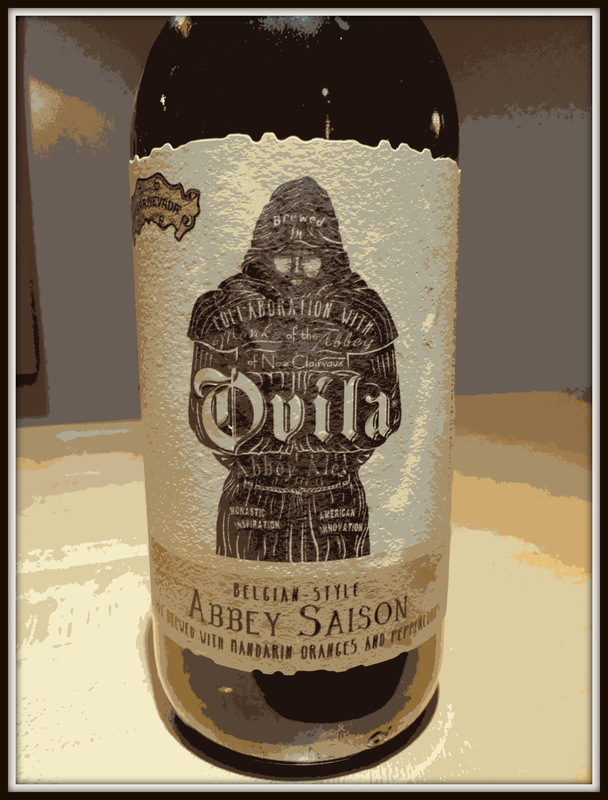 Earlier this year we did a blind tasting of Belgian Quads and this beer’s sister, Ovila Quad, finished in the top spot among North American brewed quads. So I was a little surprised when the identities of the beers were revealed and Sierra Nevada finished on the bottom (although they did also finish on the bottom of our American Porter blind tasting). Not a terrible beer by any stretch, but compared to the other saisons we tasted this beer was a little thicker and maltier. That is to say not as crisp and dry as the others. Even though it’s brewed with mandarin oranges none of us picked up overt orange flavors, in fact the fruity esters are pretty restrained overall. The black peppercorns and/or the Saison yeast do lend a moderate level of peppery spiciness at the finish. I visited The Bruery back in March and was very impressed with their beers. Furthermore, the BeerAdvocate and RateBeer ratings for Saison Rue are amongst the highest in this competition, so I had relatively high expectations for this beer. Unfortunately, it failed to live up to those expectations. It combines a honey-like sweetness with a fruity ester profile, bananas being the easiest fruit to pick out. There was uniform agreement that it was the sweetest beer of the evening. Not an unpleasant beer but it drinks more like a Belgian Blonde than a Saison. The first of four Central Ohio brewed saisons in the contest, Rockmill’s Petit Saison is a fruity offering with notes of orange and banana. The fluffy white head that develops on pouring dissipates quite quickly. Although it starts out slightly sweet the mouthfeel is light bodied and the finish is clean and dry. 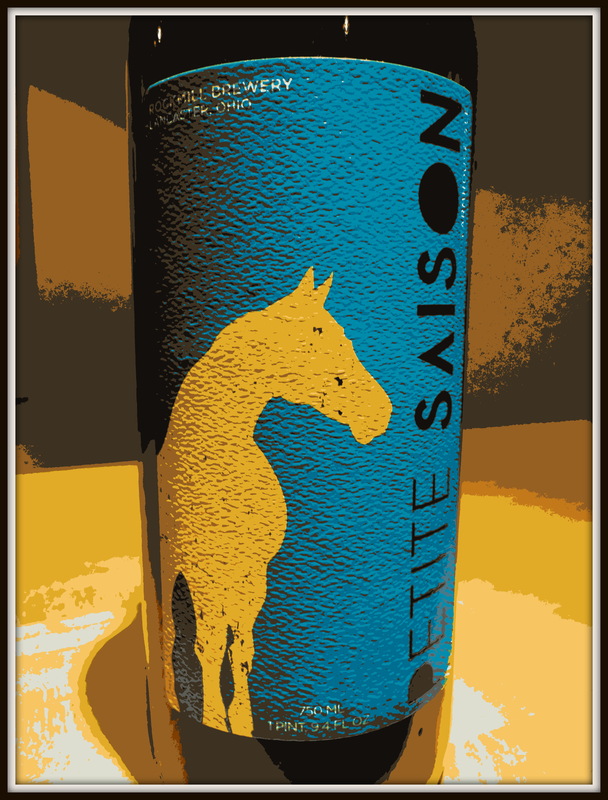 As Ted put it, Petit Saison is easy drinking and accessible but not overly complex or ambitious. Given the fact that this is a lower ABV version of the standard Rockmill Saison brewed for summer, I would imagine that is exactly what the brewer intended. Still for nearly $14 a bottle I expect a little more ambition. This is the second Central Ohio brewed saison in the list. When I reviewed this beer back in February I was very high on it. In this contest it came across as a quaffable, easy drinking Belgian-style ale. Both fruity esters and spicy phenolics are present. The mouthfeel is light bodied and appropriately carbonated, and the finish is dry and crisp. 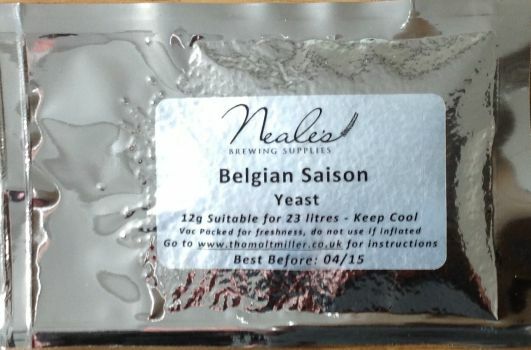 It has everything you want from a saison, but in this distinguished field it was not able to stand out from the crowd. On the plus side it is the most affordable of the local saisons. 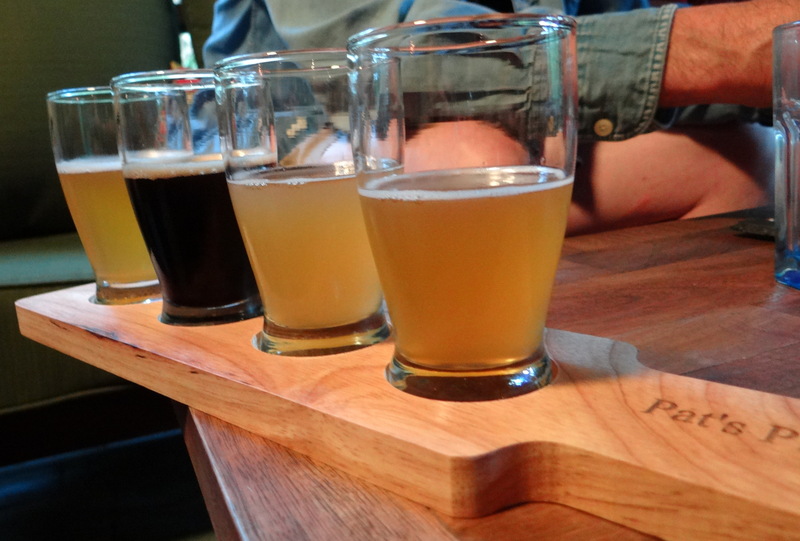 Stillwater is known for making a variety of tasty Saisons. So from the outset I wanted to put one of their beers into the competition. I ended up opting for Cellar Door, a beer brewed specifically for summertime drinking using Sterling and Citra hops and a touch of white sage. This is another beer that I have previously reviewed. It’s hopped at a level comparable to Saison Dupont, so unlike most of the saisons here bright citrus notes from the hops come through. The Stillwater yeast strain that gives it earthy notes that remind me of Brett barnyard funk, although to my knowledge Brettanomyces yeast is not used in making this beer. It drinks clean and crisp and ends with a dry finish. There is a bit of peppery phenolic character at the finish, but less than most of its competitors here. This beer reminds me a little of Orval and if I were the only judge in this contest it would have finished a little higher. Like Sideswipe, Actual Brewing is another one of the new Columbus breweries. 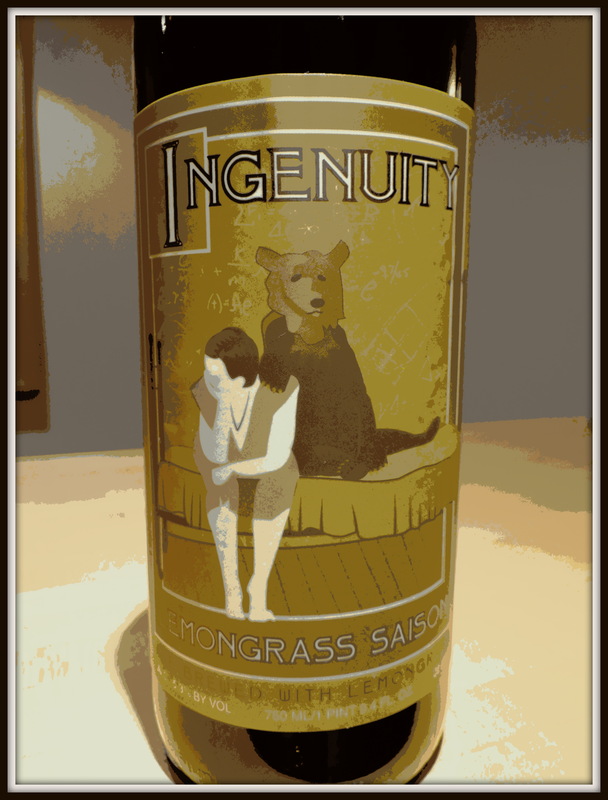 Ingenuity, their latest offering, pours with a billowing white head and its aroma is similar to the other traditional saisons. The taste is smooth wheat malts and citrus fruits. A bit of spicy black pepper arrives at the finish, but make no mistake this saison has more citrus fruit than spice. Despite the massive head that develops on pouring the mouthfeel is strangely undercarbonated. It does have the lowest abv of any of the twelve beers we sampled. Like the Rockmill’s Petit Saison it comes across as more of an easy drinking summertime beer than a world class saison. This is a favorite of mine and the only beer I’ve rated as a perfect 10 since starting this site. Thanks go out to my friends Michelle and Andy for ferrying it out to me from Oregon. Seizoen Bretta is also the most highly rated beer of the twelve on the big beer rating sites. However the rest of the group was a little less effusive in their love for the work of my favorite yeast, Brettanomyces. Not surprisingly this beer has more Brett barnyard aromas and flavors than any other beer we tasted. At the same time the spicy phenols and fruity esters are dialed back compared to a traditional Saison. The head retention and lacing were impressive, hands down the best of the night. The mouthfeel was wine-like and on the thin side, and there was the slightest hint of a metallic taste on the finish. Maybe I was too effusive when I gave it a 10 last fall, but it is still an excellent beer. 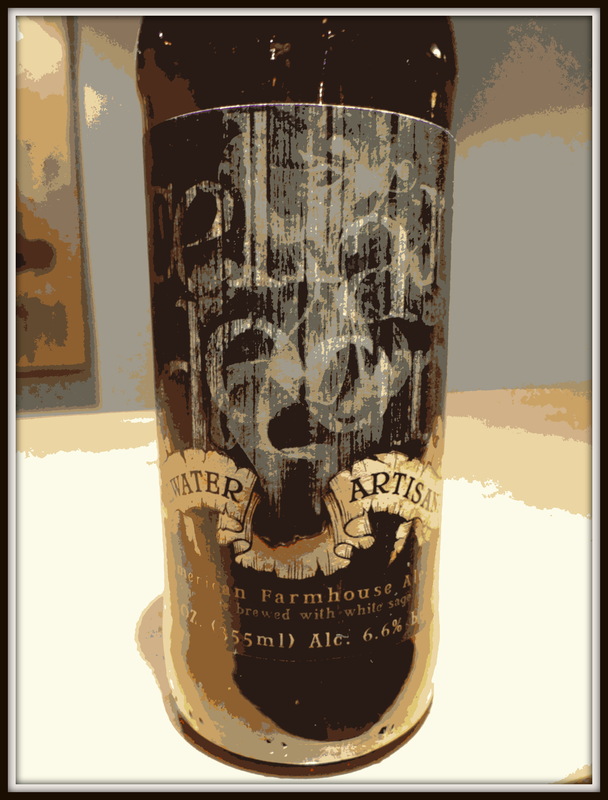 This beer is the winter seasonal from avant-guard Belgian brewer Danny Prignon and his Brasserie Fantôme. 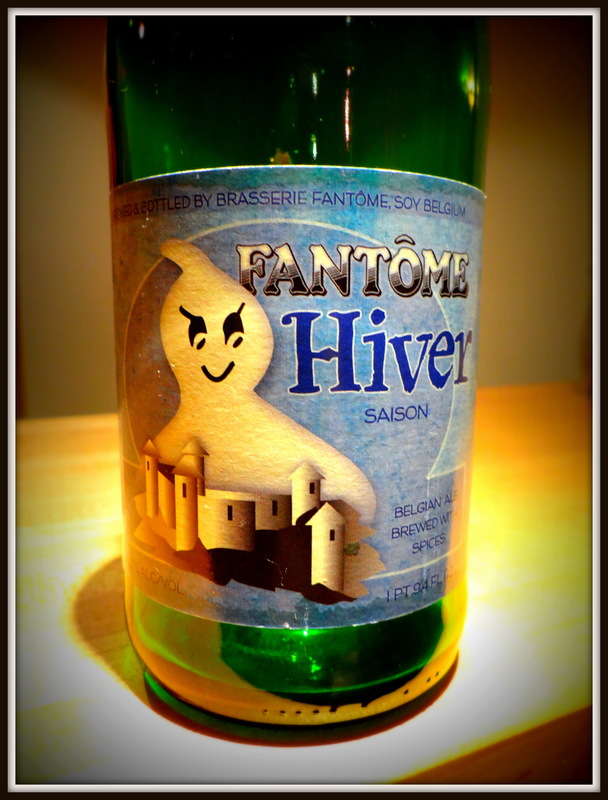 From what I’ve read Fantôme beers can be hit or miss. Here they have crafted a beer that is very much in the mold of a traditional Saison, but with everything dialed up to eleven. The yeasts have gone about their job aggressively producing bold flavors of clove and black pepper than linger on well after the finish. Fruity esters are also present. It’s effervescent and the body is a little more substantial than most of the beers we sampled. 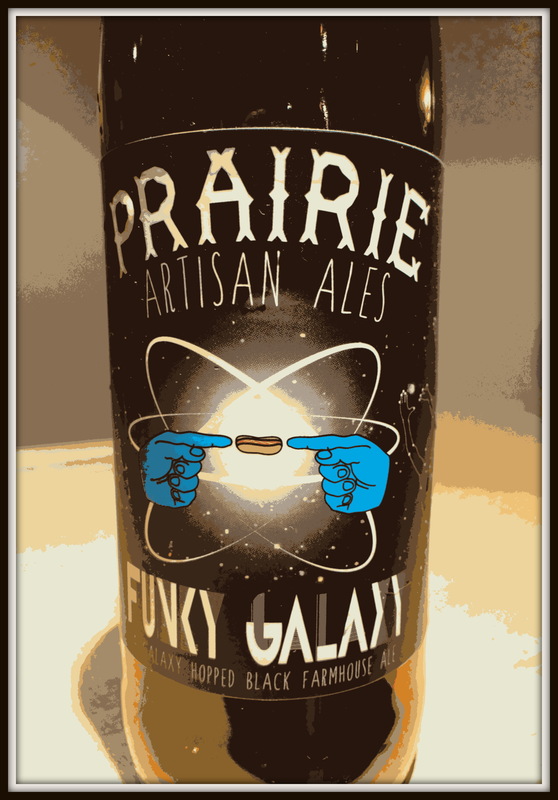 Purists will probably object to including this beer in the contest, because it is both black and features hops (Galaxy hops from Australia) more prominently than is generally acceptable for a saison, but it is labeled as a farmhouse ale and I had a bottle in my beer fridge, so why not. Not only is it black, but it is utterly opaque with a substantial creamy beige head that leaves a nice pattern of lacing as it departs. The nose is all citrus fruits, surprisingly lime is the most distinctive fruit in the mix. Despite the black color there is almost no roasted malt character in the taste, and just the slightest kiss of spicy phenolics at the finish. Instead the taste follows the nose with lime/grapefruit citrus flavors, a creamy mouthfeel, and a clean finish. I don’t think I’ve ever tasted a beer with this flavor profile. Tastewise it’s closer to a black IPA than a saison, but if you throw out the style guidelines it’s a damn good beer. 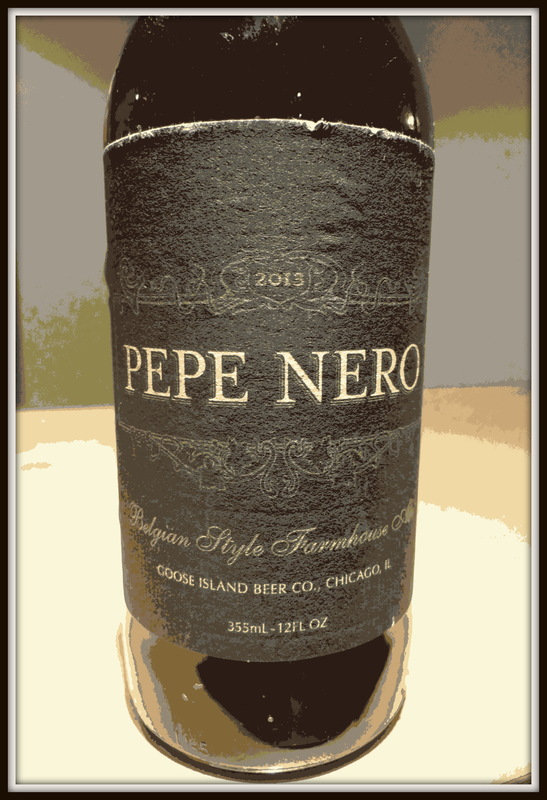 Another black saison, Goose Island’s Pepe Nero is brewed with black peppercorns to accentuate the black pepper byproducts of the yeast, and rye is used in the malt bill to further enhance the spiciness. The dark roasted malt flavors are the main attraction here, but the black pepper flavors make themselves known at the finish. Mark described it as something of a cross between a Baltic porter and a saison. There is a lot of flavor in this beer, but nothing that really challenges your palate (no acquired tastes needed to like Pepe Nero). It scores bonus points for a smooth, creamy mouthfeel. Not as edgy as Seizoen Bretta or Cellar Door, but it was well liked by everyone. In the battle of Central Ohio brewed saisons, Rockmill’s Saison Supér comes out on top by a comfortable margin. It has a boatload of phenolic spiciness—flavors of black pepper and cloves grab much of your attention. It is a shade on the sweet side, but fortunately it stops short of going over the edge and becoming cloying. The brewers at Rockmill use a larger dose of Noble hops in this beer than they do in their normal Saison, which I think helps keep the sweetness of the malts in check. I am at times critical of Rockmill for being more expensive than beers that come from Belgium, but here they show that they can brew beers that hold their own with the best Belgian brewed saisons. In a field where the scores for many beers were closely spaced, Hennepin emerged as the clear winner. It pours a hazy yellow with a creamy white head that slowly recedes to leave chunky white islands of foam floating on the surface of the beer. 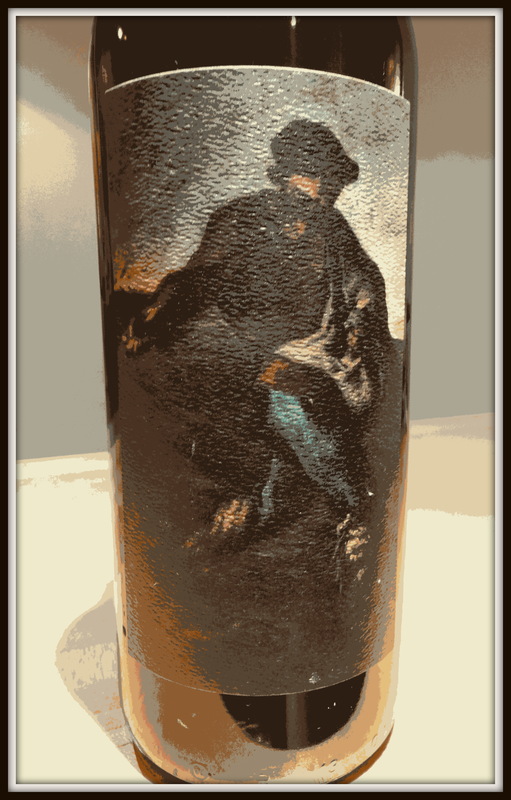 There is a harmonious blend of black pepper/clove spiciness and refreshing citrus fruitiness. It finishes crisp and dry leaving you with lingering notes of citrus and spice. It’s an unexpected bonus that it is one of the most affordable beers of the twelve we tasted. 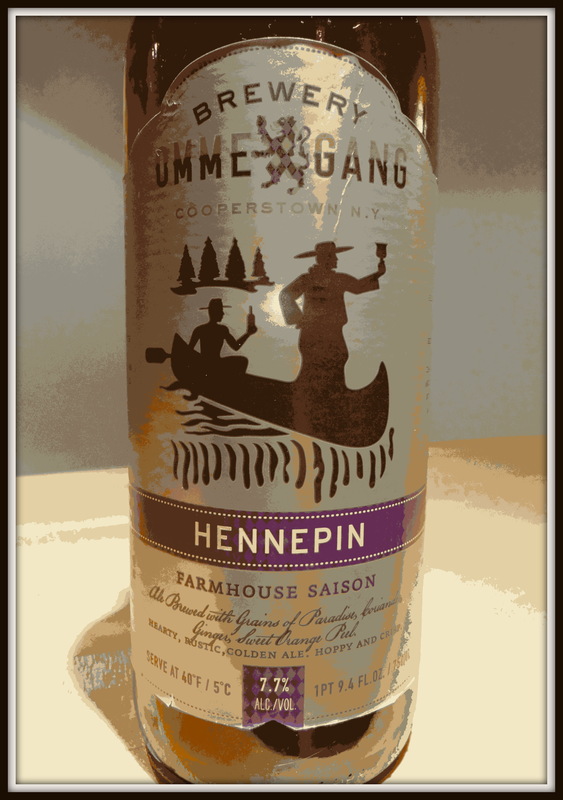 If you are looking for the best combination of taste, price and availability in a beer that stays true to the classic Saison style, Hennepin is the clear choice. That wraps it up for another blind taste test. Some of the big boys in the craft brewing world did not fare so well (Sierra Nevada, The Bruery). The local beers held their own but for the most part were not quite in the upper echelon, Rockmill’s Saison Supér being the exception. 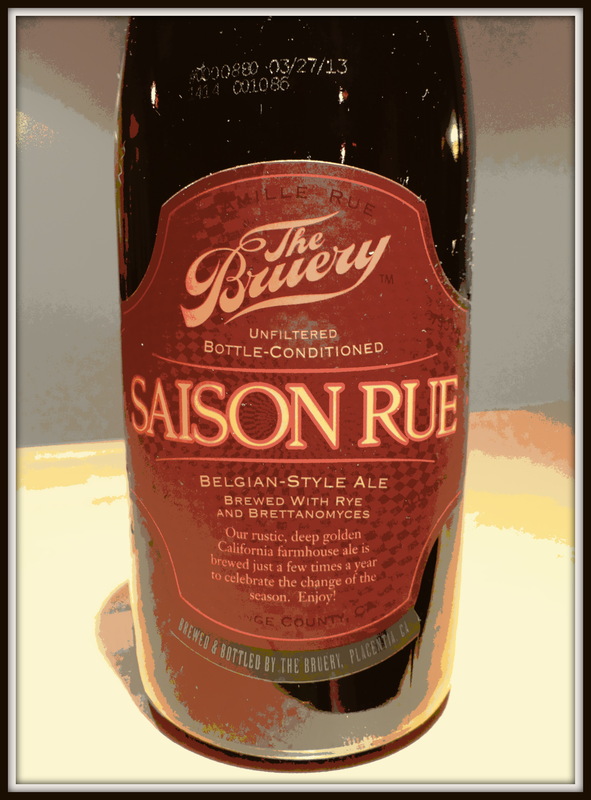 For the classic saison profile it is hard to beat Hennepin, but if you want to go in a slightly different direction there are beers here to please any palate. Long gone are the days when you had to work on a farm to enjoy a saison, so what are you waiting for. Good suggestion, I like Jolly Pumpkin beers, but I’ve not had Ban Noir. We did do a blind tasting between Bam Biere and Rockmill Saison in the Ohio vs. Michigan beer challenge last fall and Bam Biere cam out on top. No Saint Somewhere? They’re the best in the US for Farmhouse Saisons. I’ve read a few good things about Saint Somewhere, but sadly (for me) they don’t distribute to Ohio. I will have to keep my eyes open for them though. Are there particular Saint Somewhere beers that you would recommend? Cynthiana, Anne, Crepuscule, Pays Du Soleil, Vierge for Vierge Day and their staple Saison Athene. Thanks. I see on their website that they do distribute to Indiana and Michigan, so on my next trip out of state I will try to find one or more of their beers. Thanks for the tip.